An image captured from Francis Hanneman's The Quest for Electric Liederhosen. Film festival juries move in mysterious ways. Concordia filmmakers who won awards at the 31st Canadian Student Film Festival  part of the recent Montreal World Film Festival  feel honoured, but can't always account for why their work was chosen. "I saw movies that deserved to win but didn't, and vice versa," said Cinema student Francis Hanneman, whose animation short The Quest for Electric Liederhosen was named Best Animation Video. "I'm glad they liked my film, but sometimes it's hard to tell what's going on in the judges' minds." John Connolly, a Concordia lecturer in business communications who was on the student festival jury, takes the head-scratching as a compliment. "If our choices appear mysterious to people, I would say that's a good thing, because it means that we're not biased in one direction or another. Sometimes the bias of a jury is so obvious that it's farcical. In our case, we got along well, but we each had our own perspective on what constitutes a quality film." Connolly said that the jury faced a tough choice, and that a number of good films had to be passed over for recognition. "The quality of the work was very strong. I was impressed by how well the students conveyed what they were trying to say, using the language of cinema. We couldn't choose every deserving film, but considering the challenges of filmmaking, people should be proud that they were able to get them done and accepted in a film festival." Connolly, also a professor in the Cinema and Communications Department of Dawson College, says that the two most important criteria considered by the jury were originality and creativity. The Concordia winners certainly were qualified. Mika Goodfriend took an honourable mention in the Best Documentary Video category (with co-director Olivier Girard) for Pipe Dreams, a profile of his plumber. He said that their documentary is different because its subject "is a cheery, upbeat guy. Documentaries are usually very serious, sometimes about grim or depressing topics. Serious documentaries are great, but I think there is also a market for something humorous and uplifting." The Quest for Electric Liederhosen is even more offbeat, an unusual mix of traditional and computer animation. "It's about a stick figure character, drawn in traditional animation, who auditions for a part in a movie, only to learn that the director wants someone in 3D. So he transforms himself into computer animation," explained Hanneman. "The effort kills the character, which brings us to the moral of the story: Always stay true to yourself." 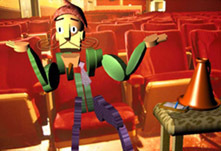 Hanneman said that film festivals have long harboured a prejudice against computer animation. "Computer animation is still a taboo at film festivals; it's still considered cold and lifeless, and the perception is that the computer does all the work. There are still old-school judges who have a bad aftertaste from the 1980s experiments, in which people produced lifeless junk like chrome dinosaurs eating cars. The idea then was on producing new images, but without a story. Hopefully, this award indicates that opinions are softening." And, Hanneman added, the computer definitely does not do all the work. "People don't realize just how time-consuming it is; computer animation is at least as hard as traditional animation. I spent countless hours on this film, struggling endlessly with abstract concepts to get everything to look just right. I spent three months to produce a four-minute video, and during that time, I had no life." Concordia Cinema student Sergio Batiz also won Best Experimental Film for El Tigre, and Communication Studies student Stephanie Finkelstein won Best Documentary Video for Beyond Language.